Today I had the MOST amazing day ever! NO, I did not go on a dream date, with a dream guy. NO, I did not indulge myself in shopping, finding the latest fashions. NO, I didn't win a million dollars; but TODAY, I witnessed 80 youth crowded around the throne of Jesus, broken, hungry, and truly authentic in their worship for God. IT. WAS. AMAZING. Refreshing, encouraging, and really the most beautiful thing I have ever seen in my life! Allow me to back up. This week is Youth Week at the church, and we kicked off the celebrations with a trip to Splashtown! I had so much fun. I totally acted like a big kid, and rode just about every ride. It didn't help that I worked on my tan! HA! After the water park, the plan was to bring the kids back to the church, feed them, and prepare them for Wednesday night Bible study. Tonight's activity: a talent show that we never got the privilege of experiencing. You see, the Greatest Performer orchestrated the most beautiful talent show where kids brought their broken lives, and exchanged them for His will! Kids were at the altar, praying for one another, encouraging one another, and just laying at the feet of Jesus. I'm sure heaven paused for a minute to catch this scene. I so wish that I could truly capture the beauty of the night. I wish I could tell you the stories that were cried out on my shoulder. Lots of tears and snot! Gotta love it...smile! I will tell you this, this current generation is considered to be lost, but tonight, about 80 youth left our church ready to spread Jesus' love and story across the world! I am so encouraged, and what a feeling to know you are walking in the will of God! It's an amazing feeling! P.S. I get my furniture tomorrow, so I'll be sure to post pictures! I'm SO excited! Home Sweet Home and a Recipe!!! These past few weeks have been a whirlwind! For starters, I moved into my new apartment, and my Dad came to visit for 4 days, I hung out with my family, went to the Jamie Foxx concert, am now back home to do laundry, unpack, and pack again for my trip to Dallas, Texas for Mary Kay Seminar!!!! When I return, I have a weeklong training, while entertaining my Godmother, the Power of Life celebration with the youth at church, and then a week long stint in Mississippi!!! However will I survive this crazy schedule? I'm sure you're dying to see the new place, and I'm dying to show it to you, but it will have to be room-by-room because my brand new living room furniture hasn't come in yet! I went ahead and ordered the pieces that I showed you here! I can't wait to see them in my pad!! I've had such a great time decorating, and I still have a few more things to get before I consider the place 'complete.' A funny story was in the midst of moving, I looked at my Dad and told him that I wasn't moving again until I got married...he of course thought that was such a drastic statement, and that I could move as many times as I needed to! Some things never change...lol! I have to admit, I was very apprehensive, and a little frightened about living alone, but I love it! And, it doesn't hurt that my neighbor across the hall is also my BFF!! LOL! I took some pics of my dining room so that you can see. The bowl on the table came from Hobby Lobby, 50% off...you'll notice this trend here! HA! The table, my Dad got me as a housewarming gift from The Dump! It was our labor of love putting that sucker together, but I'm so happy with the way it turned out! It actually has a piece that folds into the center to extend the length! It ROCKS! It's almost finished, I just have to flank the "believe" picture with two sconces I got from Southern Living for the house a while back. The rest of the pics are just my wall hangings, and my little bar area! Enjoy! I found this gem at Target today! I got this cross at Hobby Lobby! Their crosses are 50% off right now, and I racked up! I got this plaque at Waco's Junior League Holiday Market before I moved to Houston...actually, before I was even in the League! This is one of my most fave scriptures EVER! The first frame on my bar is of my Dad and I on graduation day! The next plaque is an ithcus, Christian fish, and the pink, brown, and green frame I got from Hobby Lobby for 50% off! I love me some Hobby Lobby! I frequent it often! I'll post more pictures later of the rest of my life, but I did want you to see how things are coming along! Goodnight! P.S. 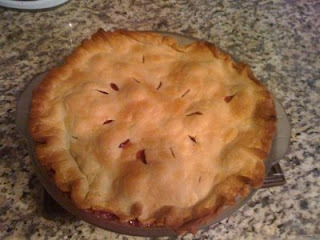 I'm participating in my very first blog hop, and I've decided to leave you with my cherry pie recipe that I have! It's super simple, and the longest part of the preparation is pitting the cherries, but it's super simple with a cherry pitter! Preheat oven to 400 degrees. Place bottom crust in piepan. Set top crust aside, covered. In a large mixing bowl combine tapioca, salt, sugar, cherries and extracts. Let stand for 15 minutes. Turn out into bottom crust and dot with butter. Cover withtop crust, flute edges and cut vents in top. Place pie on a foil lined cookie sheet--in case of drips! Bake for 50 minutes in the preheated oven until golden brown!!! It's July 4th!!! Independence Day! 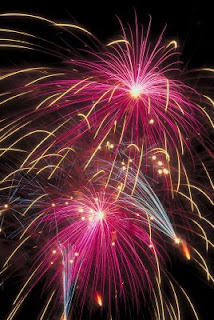 I'm not really a huge 4th of July person, but I can recall great times with my family bar-b-quing, and launching fireworks...!! This year, I'll spend with friends, and I'm looking forward to having a great time! I must admit, that this post will be all over the place because my mind has many things it wants to write about. I spent a little time looking back over my previous posts, and I've realized a few things, 1) I'm nearing post 100, and 2) I've become so much more transparent through the years. Both excite me. Transparency is something that I'm not that good at. If you know me, I mean really know me, then I'll tell you anything, but it is extremely difficult for me to be transparent with others. I am a very reserved, cautious, easy-going person who really doesn't like to 'lose control' by showing tons of emotion. Most of my friends cry so easily, and really know how to be in the moment....that is a struggle for me, but I secretly wish I could be just like them...shhh! I try, really I do, and I've gotten better. Hang in there with me....you never know what God has in store for me! I've been reading Proverbs, and it has always been one of my favorite books. It contains so much wisdom, and causes you to 'check yourself,' constantly! I LOVE THAT! Often times we think it's other people, and it's the man in the mirror...sorry shameless plug! I can't wait to see what God has for me at the end of the book. I know what I want Him to do for me, but we'll see! Oh yeah, I had a late lunch at Cheesecake Factory today, and I tried a new flavor today.... Upside Down Pineapple... oh.my.goodness!!! Heaven on a plate...craziness, just GOOOODDDD!!! I hope they never get rid of this flavor...it's definitely a keeper! I'm already planning my return trip...LOL! I'll leave you with two things. My theme scripture, and a song that I just love! I love what the psalmist says in Psalm because really does want to talk to us. He wants to show us our purpose (more on that later), and have communion with us. The video: "Cover Me," by 21:03 in collaboration with Smokie Norful, J Moss, and my fave Fred Hammond!!! I LOVE THIS SONG!! !